This is not a complete list of the local men (and women) who served in the First World War. Please click on the links shown on the left to see other information. George Charles Ashman – George was born in Holborn on 5th July 1873, the son of Joseph Ashman an engine driver and his wife, Eliza. By the 1881 Census the Ashmans had moved to live at Clifton. The 1891 Census shows the family living at Shirehampton and George had started work as a labourer. On 19th August 1895 George married Edith Grace Pratt at Kings Lynn. The 1901 Census shows George and Grace living in Albany Road, Camberwell and George was working as a stationery engine driver. They had one son, Edward Charles born in Camberwell on 26th June 1899. The family then moved to Thornbury where three more children were born: Gertrude Grace on 5th September 1904, Albert Ernest (known as Bertie in his Council School record) on 11th November 1906 and Edna Louise on 27th September 1911. When Edward Ashman was enrolled in the Council Upper School in 1906 the family lived at Crossways and the 1911 census confirms that they continued to live there. George enlisted in the Royal Engineers at Gosport on 30th July 1918. He was described as being an oil vanman (elsewhere referred to as a licensed hawker), living at Crossways, Thornbury, 5ft 5 inches, chest 35.5. inches expanded with range of 2.5 inches, weight 121 lbs, hair grey, tanned complexion, blue eyes with good physical development. Under the heading of identification marks it was noted he had had sunstroke three years before his enlistment. George was given the rank of Pioneer. He was finally demobbed and transferred to the Army Reserve on 17th January 1919. George’s wife Edith died in Thornbury in 1942. She was buried in Thornbury Cemetery. George died in in 1954 and was buried with his wife. Their daughter Louise was buried in the same grave in 2001. John Ball – John (shown in the photo on the right) was the younger son of Samuel John Ball a groom at Kyneton House and his wife, Sarah Ann, of Kington and grandson of John Ball of Uley Road, Dursley. John’s birth was registered in the Thornbury area in 1897. The 1911 Census shows that the family still lived in Kington. John’s father, Samuel was now a farm labourer and then aged 14 John himself was working as an errand boy. Before the War John was employed as a baker in Cirencester. He joined the Gloucestershire Regiment (Bristol’s Own) in May 1915 and had served as a Private in France for eight months when was killed on 2nd September 1916 in the general advance on the Somme . He was aged 19. He had previously been wounded once and contracted trench fever, and on both occasions been hospitalized in France. John had previously been a baker at Cirencester. Will Elton Ball born in Thornbury on 27th March 1893, the son of William Henry Ball, wheelwright and his wife, Alice Fanny Mary. In 1901 they were living at Crossways. In 1906 they were still living there when Will (known as Elton) was enrolled at the Council Upper School. He left the school in the same year due to illness. In 1911 they were at Easton Hill when William Henry was a foreman in the Saw Mills and Will Elton had become an apprentice wheelwright. On 13th March 1916, Will enlisted in the Gloucester Regiment Non-Combatant Corps. He was described as being ‘a wheelwright and carpenter of Easton Hill Thornbury, aged 23 yrs and 5ft 2 3/4 inches. Will married Daisy Marsh in 1922. In 1926 the Rate Book showed that they lived at Easton Hill. He died in Thornbury on 18th April 1951 of Eastend Farm, Thornbury. William Enos Ball was baptised on 15th September 1878 and was the son of a postman Daniel Ball and his wife Esther. The family lived at 5 St John Street in Thornbury. William was 37 years and three months when he was enlisted at Bristol on November 9th 1915. He was five feet three inches tall and was found unfit for military service because he was deaf. He was deemed fit for a labour battalion but was discharged on 19th July 1916. Arthur Bell – Arthur was baptised Henry Arthur Bell in Thornbury on 13th November 1867. He was the son of Arthur Bell, a labourer and his wife, Helen. Arthur enlisted in the Royal Berks in Caerphilly on 3rd September 1914. On enlistment he was described as a labourer aged 44 years 2 months, 5ft 5.5 inches, 145 lbs, 35.5 inch chest with 2.5 inch range, hazel eyes and grey and brown eyes. He had previously served in the 61st Gloucester Regiment for 7 years. He was discharged from the Royal Berks on 19th October 1914 as being medically unfit – total service 47 days. Harold Leslie Beszant – he was the brother of Dennis listed above. He enlisted in the Royal Regiment of Artillery 187th Battery in Bristol on 31st August 1914. At enlistment he was described as a groom aged 19 years 4 months, 5ft 11 inches, 132 lbs, 35 inch chest when expanded with 2 inch range, fair complexion, blue eyes and fair hair. He was discharged as not likely to become an efficient soldier for medical reasons on 16th October 1914. Total service 47 days. Next of kin – father Reginald Charles Beszant Crossways Thornbury. After the War Harold married Emily Rose Pick in Thornbury in 1920 and they lived at Eastend Farm, Siblands. Reginald Bishop – he was serving as a Private in No 5 Platoon, B Company, 1/4th Gloucestershire Regiment when he was killed on 9th April 1916. It was reported that he was on duty with a Lewis Gun Section when he was shot through the eye by a sniper’s bullet. His commanding officer wrote to tell his mother that he was ‘one of the hardest working and most cheerful men in the Platoon and a very good shot with the Lewis Gun which he proved one day when a German working party was seen after a lift in the fog’. Reginald was born in Tresham in Gloucestershire. His name was actually Reginald John Webb and his birth seems to have been registered in the Chipping Sodbury district in the September quarter of 1893. He is listed under that name in the 1901 Census when he was living in Yate with his mother Martha and her husband, Frederick Henry Bishop, whom she married in 1898. The 1911 Census shows the Bishops with Reginald Webb had moved to live in Morton Lane, Thornbury. Both Reginald and his step-father were farm labourers. In 1912 the family were living at Parkmill Cottages, Oldbury Lane. ‘Jack’ as he was called enlisted in 1st/4th Glosters at Clifton and arrived in France on 31st March 1915. He kept a diary during this period – which includes references to the weather and to the problems he had in keeping clean. On one occasion he ‘marched 14 miles for a bath, had to wipe in our shirts, no soap’. We don’t know what led to his late change of name. He is listed under the name of Bishop on the memorial at the Hebuterne Military Cemetery and the memorial at St Mary’s Church, Thornbury. William James Brealey – William was born in Bristol in 1888 and was the son of a plumber, James Brealey and his wife Rosa (nee Clarke). William was living in Lower Morton when in December 1915 at the age of 27 years and eleven months he went to Bristol to enlist. His records show that he was 5ft 5 inches tall and with a 34 inch chest. His physical development was said to be poor and he was graded C1. This meant that he was rejected for service initially and probably a second time as his medical records were stamped in Bristol on 30th May 1916 and on 29th June 1917. According to his discharge papers his army service actually began on 27th June 1917. On enlistment he served in the 96th Battalion. William joined the British Expeditionary Force in France in September 1917 and by early October he was in Rouen. He was transferred to the Labour Corps on 10 October 1917. The Labour Corps was formed in January 1917 and was manned by officers and other rank who were physically rated below “A1” the physical qualification for joining the forces. This did not mean that the Labour Corps did not have to work on the front line – on the contrary they were often deployed within range of the enemy guns for lengthy periods. The Labour Corps were employed on a range of things which included salvage operations. In William’s case his specialist military skill was noted as “postal work” and although the document showing his service record is stained and hard to read the section dealing with his regiment or corps appears to say “POSTAL”. As he was a postal worker it is interesting that he was stationed at Rouen. Rouen was one of the four Advanced Base Post Offices set up in 1915 and for a time it was one of only two Stationary Offices. By 1917 twelve million letters and almost one million parcels a week were being sent to the British Expeditionary Forces and these were seen as having a major role in keeping up moral in the troops. On 17th April 1919 he was posted to somewhere near Mons. This seems to be part of his return to England as he was sent home on 19th October 1919. When he was discharged his address was Hill View Thornbury. William Brealey died on 20th January 1955 and was buried in Thornbury. His wife Bertha died on 7th December 1977 and was buried with him. Frank C Brown – Francis Charles Brown was baptised in Berkeley on 5th June 1887. He was the son of James Brown, a labourer and his wife, Elizabeth who were living at Bevington. Francis’s service record shows the Browns were of ‘Black Hall, Berkeley’. Black Hall is a small hamlet between Bevington and Ham. Francis’s father, James, died in 1892 aged 52. The 1901 Census shows Francis living in Sibland, Thornbury. His mother is shown as the wife of George Barrett, a market gardener, Francis, and his brother, Albert, are shown as George’s stepsons and Francis is employed as a domestic servant. On 3rd January 1914 Francis married Georgina Eleanor Young in Wotton Under Edge Parish Church. They had one daughter, Loraine Frances born on 30th November 1914 when they were living at Wortley Road, WUE. Francis enlisted in November 1915 and was put into the Army Reserve. In May 1916 he was mobilised and joined the Middlesex Regiment. He was serving with them as a Private when he was killed on 16th August 1917. He is mentioned on the Tyne Cot Memorial. His service records show he was a coachman when he was enlisted. He was described as 5ft 6 3/4 inches, 140 lbs and 37 inch chest with 3 inch expansion. His home address at the time was St Mary Street, Thornbury. He started with 3rd/10th Battalion of Middlesex Regiment but transferred later to the 8th Battalion. When medically examined on enlistment in 1915 he was considered fit ‘for field service at home’. In spite of this he was sent to France in November 1916. His widow was awarded a pension of 18/9 per week. Her address was The Crescent, Dursley so perhaps she went back to her home town. Thomas Francis Henry Cornock – baptised on 5th June 1887, the son of William Cornock, a sawyer and his wife, Harriet. They were living in Bath Road at the time of Thomas’s birth but later moved to Horseshoe Lane and then on to Gillingstool. In 1905 Thomas married Annie Onions in the Aston area of Birmingham. The 1911 Census shows he and Annie were living in Cromwell Street, Birmingham and Thomas was working as a deal carrier in the Saw Mills. During the First Worl War, Thomas was serving as a Private in the Welsh Regiment 1st/4th Battalion. He was killed on 26th March 1917 in Palestine and his name appears on the Jerusalem Memorial. The notes in the Soldiers who died in the War database show that Thomas had previously served in Gloucester Regiment. The Commonwealth War Graves website notes that Thomas was the ‘Son of William and Harriett Cornock, of 161, Scholefield St., Nechells, Birmingham; husband of Annie Cornock, of Western Australia’. John Cullimore – John is listed on the war memorial at St Mary’s Church, but he was born at Faulkner Lodge, Christleton in Cheshire on 8th May 1890. He was the son of John Cullimore, a solicitor who was born in Almondsbury near Thornbury and his wife Mary Elizabeth (nee Dale) from Stoke Newington in London. He was also the cousin of the Smart Cullimore listed below. In spite of John’s home being in Cheshire, his family had connections with the Thornbury area and still owned Manor Farm at Morton. In the 1901 census John and his family were living at Faulkners Lodge, Christleton. John was educated first at Arnold House School in Chester but by the 1911 Census he was a pupil at Marlborough College. He was a student at Cambridge where he served in the Officers’ Training Corps. In the First World War he served in the 8th Battalion of the Cheshire Regiment. He fought as a machine gun officer in Gallipoli. He was twice mentioned in dispatches. According to the website for the ‘8th Cheshires’, his battalion was transferred to Egypt in January 1916 and in the following month to Mesopotamia. He was a Lieutenant when he was killed at Amara in what was then Mesopotamia (now Iraq) on 16th April 1916. He was buried in Amara Cemetery. Elizabeth Exell was baptised on 16th January 1885, one of the daughters of George Henry and Eliza Exell. She was awarded the British and Victory Medals and the 1914 Star. We understand she served in France as a nurse until 1917 when she came back to continue nursing in a large military hospital in London. Her army records indicate that she served from 18th August 1914 until 11th April 1923, but her obituary says she was appointed Matron of Pype Hayes Convalescent Home in Birmingham in 1922. She left there to become Matron of the Carnegie Institute for Child Welfare in Birmingham when it opened in 1923. John Ford – the memorial at St Mary’s Church lists John Ford as a driver in the Royal Field Artillery. We know that John was serving with the ‘B’ Battery, 58th Brigade of the RFA when he died of wounds in Flanders on 13th July 1917. He was buried in the Lijssenthoek Military Cemetery near Poperinge, Belgium. We believe that John was the William John Ford baptised in St Mary’s Church on 27th March 1892. He was the son of William Ford, a labourer in a stone quarry and his wife, Eliza. At the time of the 1901 census the family were living at Grovesend. John’s mother died in the Thornbury Union workhouse in 1903. We don’t know what happened to his father. In the 1911 census John was a mason’s labourer living at Crossways. The Army Registers relating to soldiers’ effects show that John authorised any payments to be made to the Thornbury Board of Guardians. Herbert Fowler – (shown in the photo on the right) he was born in 1896, the son of Elias and Sarah Louisa Fowler. The family were from Hamfallow, Berkeley where Elias had been sexton at the Cemetery. The 1911 Census shows Elias had moved the family to Heathfield where he had become a hawker and dealer and Herbert had become a hawker. The family later moved to The Hackett, Thornbury . In the War Herbert had joined the 1st/1st Battalion, Herefordshire Regiment as a Private Fowler when he was killed in action in Palestine on 6th November 1917. He was aged 21 and had been serving in Egypt for just over 12 months. His name is listed on the War Memorial at Beersheba in Israel, but it is not included on the St Mary’s War Memorial. Charles Osborne Harvey – baptised at Thornbury St Mary’s Church on 5th March 1876. He was the son of a mason. Henry Harvey and his wife Sarah who for many years lived at Horseshoe Lane, Thornbury. The 1901 Census shows Henry had moved to London – he was employed as a gardener and living at 1 College Terrace, Regents Park Road. He married Bessie Louisa Fry in the Barnet area of London in 1905. The 1911 Census shows them living at 28 Lichfield Grove, Finchley. Charles was employed as a jobbing gardener. Elton, James, Albert and Mark Hill – a newspaper report of 22nd June 1918 said that Private Elton Hill aged 24 of the Gloucesters Regiment had been wounded in action for the third time and been sent home on 14 days leave with a gunshot wound in his leg. After only four days he was recalled to join the Gloucester Reserve in Northumberland waiting to be sent to France. He had joined up at the beginning of the war and after 14 days training arrived in France. Elton was the son of Thomas Wiggle Hill and his wife Emily who married in 1872. The article says that that the family lived at St Mary Street in Thornbury but we have so far been unable to trace where they lived. The1901 Census shows them living at Wanswell near Berkeley. In that census Emily although still married was alone with her children, except for her widowed mother Mary Biddle aged 77. Thomas Hill was a river pilot at Sharpness where he had lived for 27 years and so he may have been away from home because of his work. In the 1901 Census Elton was aged 10 and had two older brothers Hartley aged 21 a dock labourer and Mark aged 16 a carpenter. There were three younger children Winifred aged eight, James six and Albert four. The newspaper article that reported on Elton’s return to the front, despite being convalescent from his wounds also mentioned his brothers. Sergeant Albert Hill aged 21 had joined up the same time as his brother and was serving in the RFA in France. James had joined the Grenadier Guards when his brothers joined up. He was severely wounded and was discharged. 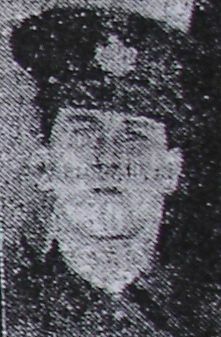 Mark had joined up in early 1918 and was training in England. It seems that at the time of the newspaper article Emily and Thomas also had two sons in law serving, one had been in the Royal Engineers in France but had been discharged and the other was training in England and due to leave for the Front shortly. We know that James Biddle Hill survived the war. He was living at Raglan Castle in Thornbury by 1921. He was linesman and lived at Eastland Road later in his life. He died 14th February 1960 aged 64. He and his wife Gladys May are buried in Thornbury Cemetery. William Noel Hodgson – ‘Bill’ was the youngest son of the vicar of St Mary’s Church, Henry Bernard Hodgson and his wife Penelope (nee Warren). He was baptised in Thornbury in 1893. He was educated at home but when the family moved to Berwick he went to Durham School. In 1911 he gained a scholarship to study Classics at Christ Church College, Oxford and whilst here he joined the Officers’ Training Corps. His father hoped that Bill would follow him in the Church, but he volunteered for the army at the outbreak of war in 1914. He joined the 9th Battalion, Devonshire Regiment and went to France in the summer of 1915. He became known as ‘Smiler’ by his comrades. He fought in the Battle of Loos, where, with three other young officers and 100 men, he defended a trench for 36 hours before reinforcements arrived. He was awarded the Military Cross for his bravery in October 1915. On 1st July 1916 his battalion attacked a German trench at Mametz as part of the Somme Offensive. Bill was killed when a bullet caught him in the throat whilst trying to carry fresh grenades to his men. He was aged 23. Bill was a noted author and war poet publishing works under the pen name of Edward Melbourne. He wrote his last poem ‘Before Action’ on the eve of the Battle of the Somme. In this poem he seemed to predict his death. The Christ Church, Oxford website has a detailed account of his life, his experiences in the Army with a photograph and the text of his poem ‘Before Action’ which he wrote on the eve of the Battle of the Somme. We have copied this information onto our website purely for ease of access. Click here to read the Christ Church account. His life has been extensively researched by Charlotte Zeepvat who has published extracts from his diary on a website about W.N. Hodgson, His World, His War, His Memory. William George Jones – according to the source ‘Soldiers Died in the Great War’ William was born in Thornbury and it was still his home when he was killed in action in Flanders on 26th September 1916. William was a sapper serving in the Corps of Royal Engineers and formerly served with the South Wales Borderers 180th Tunnelling Company. The Commonwealth War Graves site shows that at the time of his death, William was aged 26 and the son of Mrs Mary Ann Jones of Alveston Down. He was listed on the Thiepval Memorial on the Somme and locally on the memorial at Alveston St Helens Church. Grantley Reginald King – is listed on the St Mary’s War Memorial. The Commonwealth War Graves website shows that he was the son of James and Emily Ann King of Grovesend near Thornbury. Grantley was born in 1897. The 1901 Census shows that he was born in Berkeley. At that time he was living with his mother, then a widow at Woodford. In 1909 Emily married Oliver Kingscott of Tytherington, who worked as a stone quarryman. By the time of the 1911 census the family were living at Grovesend and Grantley was given the surname of Kingscott. We have learned from Meg Wise of Thornbury Museum that Grantley enlisted in Bristol into Bristol’s Own, 12th Battalion, Glosters under the surname King. The Battalion arrived in France in late November 1915. The attached photograph was taken from the Roll of Honour published in the Gazette in 1915. Grantley was listed as a ‘Nurse serving in France’. We cannot explain why he was described as a nurse when this seems very unlikely. The War Graves website shows he was serving as a Lance Corporal in 12th Battalion Gloucester Regiment when he was killed. He died on 19th May 1916 and is buried in Faubourg D’Amiens Cemetery, Arras. George Lambert – shown in the photo on the right) was baptised George Edward Lambert in Thornbury on 13th November 1898, the son of Emily Lambert of Morton. In 1904 George’s mother married Frank Bennett in the Bristol area. Prior to the War, George was in Canada where he joined up and came over to Europe with the Canadian Contingent. He was discharged because of his bad eyesight, but re-enlisted in the Gloucestershire Regiment giving his residence as Crossways. He served in France as a Private for one year and 8 months when he caught enteric fever and was invalided home. On recovering he returned to France where he was killed by a shell bursting quite close to him on 19th August 1917. The Commonwealth War Graves website shows George was serving with the 1st/6th Battalion Royal Warwickshire Regiment and is listed on the memorial at Tyne Cot. His mother, Mrs Frank Bennett was then living at 15 Eastland Road, Thornbury. His name does not appear in the Roll of Honour in St Mary’s Church, but does appear on the Roll of Honour in the Baptist Church and St Paul’s Church. On both these memorials he appears as Harold Ernest Lanfear. 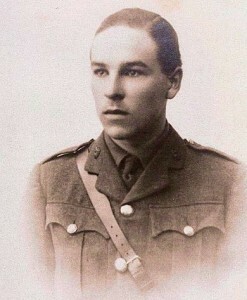 Edward Eli Lippiatt served in the R.A.M.C. from 1914. At the time he enlisted he was 41 years and four months. He was born in Thornbury in 1872 in the Thornbury Union. His mother Hester baptised him on 19th October 1872. He was a collier at Pontinewydd at the time of his enlistment but he had already served with the 13th Somerset Light Infantry. He married Isabel Chamberlain in Monmouthshire on 10th April 1909 and his next of kin in 1914 was “Mrs Lippiatt of 35 New Street Pontynewydd West Newport in Monmouthshire.” Isabel and Henry had three children Charles Henry (1909), Doris (1911) and Thomas Edward (1914). He was 5ft 8 inches tall with auburn hair and blue eyes and he was a Presbyterian. James Longden (or Langden) – he is listed under the name of ‘Longden’ on the St Mary’s War Memorial. However the Commonwealth War Graves website and the Soldiers Died in the Great War database lists him under the name of ‘Langden’. He died on 25th April 1918 whilst serving as a Private in 12th Battalion Gloucestershire Regiment. He is listed on the Ploegsteert Memorial. We suspect that the correct name is Longden as there were at least two James Longdens in the Thornbury area. William Longden – William Henry Longden was born in December quarter 1895 and baptised in Thornbury on 12th January 1896. He was the son of George Longden, a mason and his wife, Mary Anne. We think that Mary Anne died in child birth when William was born or shortly after as her death is also recorded in December 1895 aged 44. The 1901 Census shows George and his family including William were boarding with Jane Riddle whose husband, Luke, was in the Workhouse. When Luke died in 1902 Jane married George Longden. The 1911 Census shows the family living in Hollytree Cottage, Grovesend and William was an errand boy aged 15. During the First World War William enlisted in the South Wales Borderers 10th Battalion. He was a Sergeant when he was killed on 8th October 1918. He was buried at Guizancourt Farm Cemetery, Gouy near Cambrai, France.